Praia do Cachorro Beach, Fernando de Noronha, Brazil. Praia do Cachorro or the dog’s beach has a story behind its name. Praia do Cachorro is also known as the dog’s beach. Its name comes from a bronze fountain carved in the shape of a dog’s face but this fountain no longer exists though the name still does. Located just below the Remedios fort, it is the most sought after beach by the locals and the tourists because the beach is easily accessible. The main attractions of this beach are a fresh water spring, a stone cavity for swimming called the Galego cavity, a salting stone used by the local fisher folk and the ruins of Santana fortress which is open to tourists. The waters of Praia do Cachorro wear an emerald green color covered with coral reefs underneath. The tidal movements and changing seasons of Fernando de Noronha, makes this beach take on two appearances during the year. For some seasons the beach is covered with pebbles and for some other seasons it is covered with sand. The coral reefs beneath the waters actually obstruct the waves and stop them from reaching the shore. The beach is also a great spot for surfing. 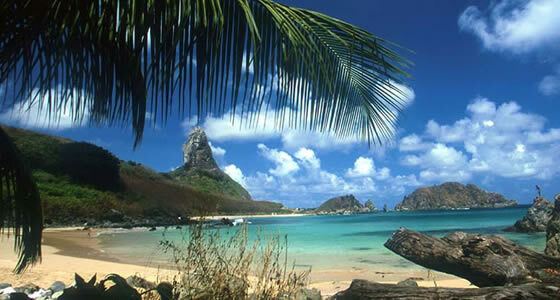 On the beach you will find the typical markets of Fernando de Noronha, with fairs, handicraft shops and bars. The Dog Bar is a watering hole frequented by tourists and comes alive in the night.